Deal Physical damage to target enemy and remove 20% Turn Meter, doubled against buffed enemies. 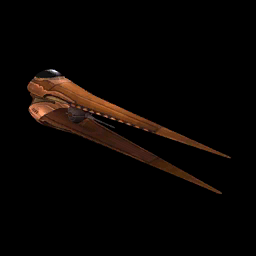 While Geonosian Soldier's Starfighter is active, all Geonosian allies gain +10% Accuracy for each active Geonosian ally. In addition, Geonosian Soldier's Starfighter has a 35% chance to Assist, dealing 20% less damage, whenever an ally uses an ability during their turn. This chance is doubled for Separatist allies. Enter Battle: Geonosian Soldier's Starfighter gains Offense Up for 2 turns and gains an additional +30% Offense on his next attack.